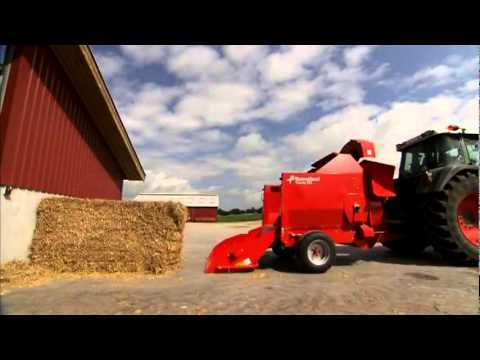 The Kverneland 853 is specifically designed to chop and distribute straw, hay and silage. It provides a flexible and efficient solution for bedding and feeding when working with baled straw, hay or silage and clamp silage. Solid construction ensures reliable performance and long machine life. The 3m3 bale chamber is capable of transporting the largest square bales or 2 round bales. The two speed gear box makes it easy to set the machine for either bedding or feeding purposes. The standard control terminal allows you to easily control the chutes and speed of the chain-and-slat conveyor during work. Bedding of straw up to 20m. The 1.55m diameter flywheel of the Kverneland 850 series is fitted with 6 blowing paddles, providing a powerful blow for the most efficient distribution of the material and an excellent cleaning of the flywheel housing. In combination with the 2-speed gearbox (standard on models 853 and 856) the flywheel can throw straw up to 18.00m (on high speed) or gently feed hay/silage at the side of the machine (at low speed). With the 280° swivel chute discharge straw can be blown up to 15.00m.